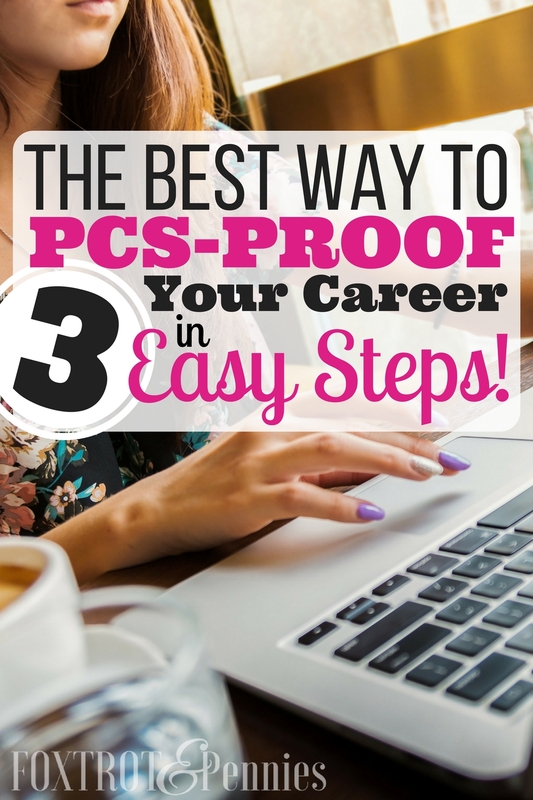 Inside: Follow these simple steps to PCS proof your career and work from anywhere, regardless of where you are stationed. Having a ton of extra money isn’t something a lot of military spouses experience. In fact, recent studies have shown that an alarming 26% of military spouses face unemployment challenges. Living on one income can be difficult. You cut expenses, and budget your finances, and find ways to save but you still wonder why you can’t get ahead. Every holiday, birthday party, or non-monthly expense (like oil changes or other annoying money-sucking expenses that always pop up at the worst times) causes you to lose sleep. It causes tears and arguments with your spouse. The solution is actually pretty simple, believe it or not. Want that pricey toy? Do more chores. Want to buy a car? Get a job. Get a job. What an easy answer to not having money, right? My first job was working as a busser at 15 years old– I wanted an $800 DSLR camera and I was brought up to work for what I wanted. I saved up my tip money all summer in an old shoe-box and bought it. I was really proud of myself, mainly because I have literally zero patience and I wanted that camera now. You have a job that you love, you are getting ahead on your bills and setting up a killer PCS-fund then BAM; you get those orders. Now you have to put in your two-week notice and move to a new location half-way across the country (or better yet; in a different country). You have to figure out what to do with your kids when there’s no one around that you trust to watch them. You’ll have to try to find an employer that doesn’t care that you are willing to work there for “maybe a year, hopefully three”. You might even have to find the extra room in your budget to transfer your professional license to your new state. That 26% unemployment rate is starting to make a little more sense. But what if there was an easier way? I’m serious! Don’t get a job; create one. Create a job for yourself that you love. One that you own, and run successfully (even if you have no business background). A job that you can pack up and move with you wherever you go. You can literally work from anywhere. When I started my blog, I knew I wanted to grow it into a business. I didn’t just want to work from anywhere, I wanted to work from home. I wanted to be home with my son while being able to help a community I feel so passionate about. Choosing to give up my full-time nursing position so that I could stay home with my son turned out to be one of the best decisions for our family. However, I did decide to continue working there as a per-diem employee so that I could work a couple shifts a month for a little extra income (about $400 a month). Not to mention, it’s unbelievably scary to quit a job that has given you so much financial security in the past. Within a few months, I had surpassed what I was making at my part time job from the comfort of my sweatpants. Step one: what are you good at? When I sat down and thought of my skills, only one came to mind: nursing. It’s what I went to college for, it’s what I’ve studied and it’s the only professional career I’ve ever had. When I really thought about it, I actually discovered I have multiple skills: I have graphic design skills, writing skills (well, the free app Grammarly helps a lot), and the ability to budget and save money. So what about you? You need to figure out what your basic skills are and then decide where you want to go with them. Maybe you are a social worker and have a passion for working with domestic violence victims. Maybe you are in finance but can DIY the heck out of anything and want to show others how they can too! Start by making a list of all the things you are good at (whether they make sense in the “business world” or not). Then make a different list of things you are passionate about. Things that you love to do but others often struggle with. The key is to have an intersection somewhere because the best businesses are the ones that help other people solve their problems. I want to clarify something here. There are so many PCS proof business ideas it’s insane. In fact, if I were to show you a list of ideas (actually, here’s one right here.) I think it would literally blow your mind. I’m not just talking about blogging. Maybe you are an amazing writer, so amazing that other bloggers will pay you to write content for them so they can focus on creating profitable products (it’s called being a ghostwriter). Stock photography for blogs. Seriously, it’s slim pickins for stock photography these days- bloggers need killer images and will pay for them!! The best part is that all of these businesses can be started with very little money. You can even get a website going right now for only $3.95/month. Imagine being able to PCS in two weeks notice and not worry about not having that second income you rely to heavily on to make ends meet. Actually, let’s take it a step further; imagine waking up one morning in the middle of your PCS road trip and seeing that you’ve made money without actually working. It will happen. You can do this. The thing is, it’s not always easy to figure out how. And military spouses face different challenges than typical business owners. Luckily, there is a course made just for you (the military spouse). It’s called the Work From Anywhere academy (created by Kayla from The Navy Mom) and it is a step-by-step program that will show you exactly how to create a successful PCS proof business. It is designed to literally walk you through everything you need to do to start up a business and sustain it through military life. You don’t need to have a background in business (it’s okay because Kayla does!) and you don’t need to know all the legal mumbo-jumbo of moving your business around; she will teach you. The best part is that it’s actually affordable. This program is for anyone looking to start their own business. It’s also for ones that have already started one but want to take it to the next level. However, it’s only available a couple times a year. You need to have amazing timing in order to get in (you can get on their waitlist here). The cool part is that Kayla has set up FREE training for anyone interested in growing a business that is available all the time (you can register for free here). NOTE: Right now, enrollment for the Work From Anywhere Academy is CLOSED, you can get on the waitlist here. Want a business that travels with you wherever you’re stationed? Create one! Everyone has a choice. You certainly figure out how to get ahead financially with a good budgeting system or even learning how to cut spending in everyday aspects of life. But think about how different your life could be if you were making money from home (or whatever duty station happens to have your address). Can you really afford not to do this? I couldn’t. I had no option but to make some kind of money, no matter how much we cut back. Luckily for me, I’m stubborn and made it happen. Unlucky for me, I had to figure it out for myself and it took me almost a year of mistakes (and earning no money) before I was finally pointed in the right direction. I relaunched my blog and with Kayla’s help, I was able to start earning money. She helped me set up my sponsorship package, set rates for myself, and land a private sponsored post that ultimately gave me my first real “paycheck” from blogging. A few months later, I surpassed what I was making at my part-time nursing gig. I created an opportunity for myself, I created a job.